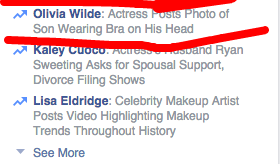 How come I DON'T GET A #TRENDING POST when I wear MY BRA over my head?! I know, I know, I'm not a Hollywood star. Perhaps I can get my mom to tweet my very flattering bra photo from the aftermath of this year's Christmas party. Also, who the hell is Lisa Eldridge and why am I NOT WRITING MY DISSERTATION ON THE HISTORY OF MAKEUP? !